A C-130E Hercules flying over the Atlantic Ocean. The Lockheed C-130 Hercules is a military transport aircraft. The aircraft was first introduced (made available) in 1957. It is still used today by over 60 countries worldwide in active service. 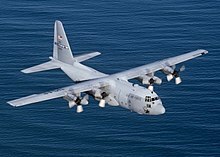 There are over 40 models and types of the C-130.